CHILI — When St. Pius Tenth Parish’s church was destroyed by fire in January 2015, Parochial Administrator Father Paul Bonacci spoke about being an Easter people and the resurrection of Jesus Christ. On March 19, just two weeks before Easter 2018, the faith of parishioners was rewarded when a new church was dedicated during a special Mass celebrated by Bishop Salvatore R. Matano. Hundreds of parishioners, community leaders and area residents packed into the standing-room-only celebration of the parish’s rebirth on the feast day of St. Joseph. That date was chosen for the dedication because of its significance in the church, explained Brian Porter, who led the parish’s rebuilding committee. Members of the rebuilding committee were among those whom Father Bonacci asked to stand for recognition and thunderous applause before the Mass concluded. 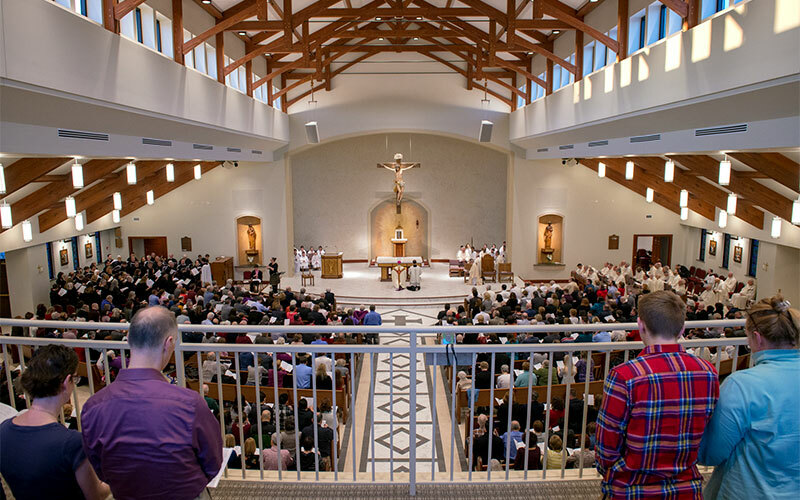 He thanked all who made the March 19 dedication possible, including members of the design committee and his staff, and all the parishioners who were steadfast in supporting the parish. In the homily, Bishop Matano called the new church building a magnificent house of the Lord. Among the memories to be born will be reception of the Holy Eucharist, the joining of men and women in the sacrament of matrimony, and children being baptized and becoming God’s own children, Bishop Matano said. Bishop Matano then said a prayer of dedication before he rubbed the Oil of Chrism on the Italian marble top of the altar before blessing it with incense. Each of the altar’s two side walls features an alcove containing a fire-singed statue from the original church building. Then he once again walked the perimeter of the nave to make the sign of the cross below four cross-shaped sconces on the church walls. Candles on the altar and throughout the church were lighted just before the Liturgy of the Eucharist began, as altar servers placed two bouquets of white flowers in front of the altar. The lighted candle represents the light of Christ, while flowers bring in beauty of the natural world into God’s house, Bishop Matano said in his homily. Before and after Mass, parishioners young and old expressed great excitement at seeing their new church. Elizabeth Zerrillo, 14, a youth-group member who helped pass out cookies during a reception after Mass, also said she was thrilled to see the return of so many people who had been worshipping at other churches following the fire. The timing of the dedication before Holy Week could not have been better, she said. 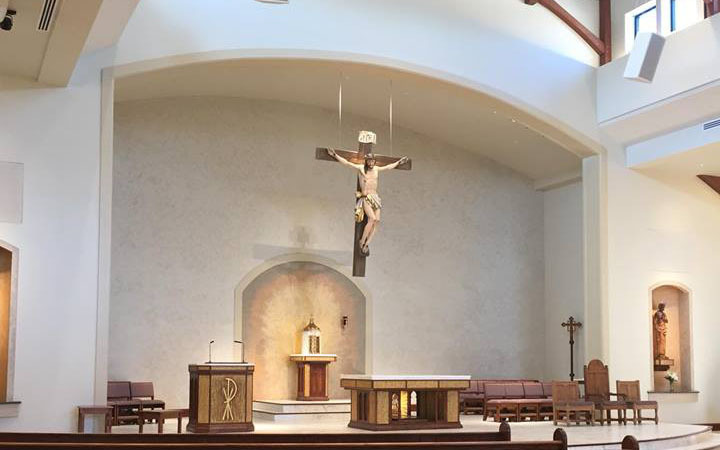 EDITOR'S NOTE: To see a multimedia presentation on the new church, visit www.catholiccourier.com/stpius​.